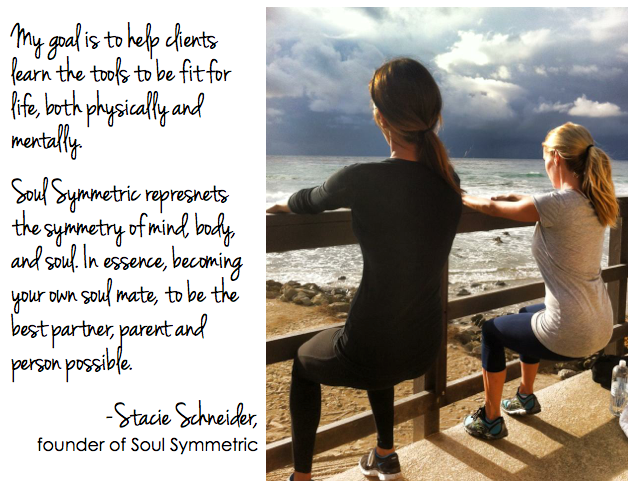 Get excited to meet to meet the founder of Soul Symmetric and total Beach Babe, Stacie Schneider. Stacie and I met while teaching at Core et' Barre. An excellent instructor and fitness enthusiast, I knew I needed to interview Stacie when I heard about the non-profit company she started called Soul Symmetric. Stacie has a truly inspiring story and outreach program and I am so excited to introduce you to this very special lady! She truly understands the importance of integrating health and wellness into a daily lifestyle to not only look good physically, but on an emotional level as well. I know her story will inspire you as much as it did me! 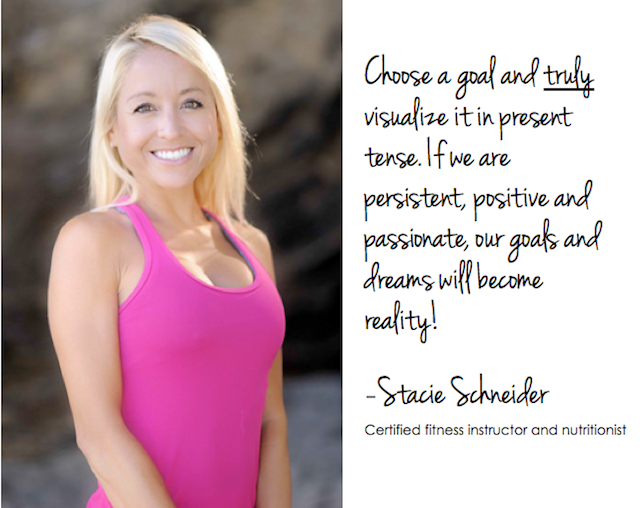 My name is Stacie Schneider, Certified Trainer and Nutritionist. I have been in the fitness and nutrition industry for over 14 years am I am currently working toward my M.S. in Dietetics. In February 2013, I founded Soul Symmetric, a nonprofit organization serving recovery homes in Southern California. I am also an instructor and studio nutritionist at Core et' Barre in Newport Beach and a spin instructor at Studio Cycle in Corona del Mar & Curl Fitness in Newport Beach. What inspired you to start Soul Symmetric? Tell us more about that. Over the years I have lost friends and family who were ultimately defeated by their addictions, most recently 2 months ago with the loss of my step mom. Due to an inability to efficiently process my own feelings, I struggled with codependent relationships and addictive behaviors while growing up. Refusing to continue negative patterns, I found emotional sobriety through a variety of outdoor fitness activities, music therapy, proper nutrition and commitment to happiness. Then, in August of 2012, I was run off the road on my bicycle and sustained a traumatic brain injury. During my recovery, I worked on speech and communication skills, language comprehension, balance, memory and my loss of emotional sobriety. I once again achieved emotional sobriety and started Soul Symmetric to help others through a variety of out door activities, music therapy and proper nutrition. What does your tagline mean, to "take fit beyond the physical"? My goal is to help clients learn the tools to be fit for life, both physically and mentally. Soul Symmetric represents the symmetry of mind, body and soul. In essence, becoming your own soul mate, to be the best partner, parent and person possible.We are dedicated to helping our clients achieve emotional sobriety and become Soul Symmetric through open-air fitness, customized nutrition and music therapy. 2 hills, step-ups with knee lifts, jogging the jetty wall & a final sprint down the beach. Intervals are my favorite because I burn more calories and increase cardio strength. The stairs, step-ups and darting children on the beach forces you to stay present; making it a cognitive workout, which helps with brain function. It's always a challenge and I can do this workout wherever I go. I love the release of endorphins/runner's high I get every time! What's your favorite part about teaching? My favorite part about teaching is seeing my clients making progress... both physically and mentally. I love the smiles and positive energy my clients have when they've reached another short term goal & are excited to keep working toward their long term goal. I keep my clients motivated by being positive, mixing up every workout & challenging them to push themselves to their max both physically and mentally, which leaves them with a sense of accomplishment. My clients also feel like I can identify with them. I share stories about my past....struggles, injuries, trials & errors, etc., which makes me a real person whose achieved their personal goals, rather than a "fitness instructor." My clients see the way that I challenge myself daily. Everything I teach my clients about fitness, nutrition and music therapy are programs that I have used, tested and have been proven to work. How does diet and nutrition affect your emotional and physical well being? Processed food (food with chemically produced/unnatural additives) affects our physical well being because our bodies were not created to digest chemicals. The damage can range anywhere from weight gain to sudden food allergies & intolerances. The emotional effects are bad as well. A lot of times we feel sad, achy or just "don't feel well"out of nowhere. Many times it due to the processed food we eat and how those chemicals are reacting with our own body's natural chemistry. Choose a goal and truly visualize it in present tense. If we are persistent, positive and passionate, our goals and dreams will become reality!